Teva Pharmaceutical Industries Limited develops, manufactures, markets, and distributes pharmaceutical products worldwide. This dividend achiever has paid dividends since 1984, and has increased them for 13 years in a row. The company’s last dividend increase was in February 2013 when the Board of Directors approved a 25% increase in the quarterly distribution to 1 NIS /share. The company’s peer group includes Actavis (ACT), Taro Pharmaceutical (TARO) and Revlon (REV). Over the past decade this dividend growth stock has delivered an annualized total return of 8.10% to its shareholders. The company has managed to deliver a 7.30% average increase in annual EPS since 2003. Analysts expect Teva Pharmaceutical to earn $5.07 per share in 2013 and $5.54 per share in 2014. 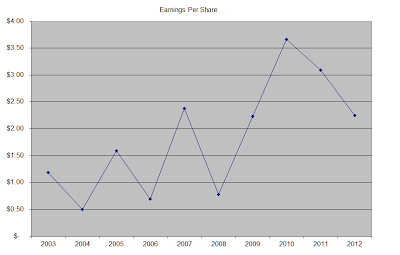 In comparison, the company earned $2.25/share in 2012. Over the next five years, analysts expect EPS to rise by 6.81%/annum. 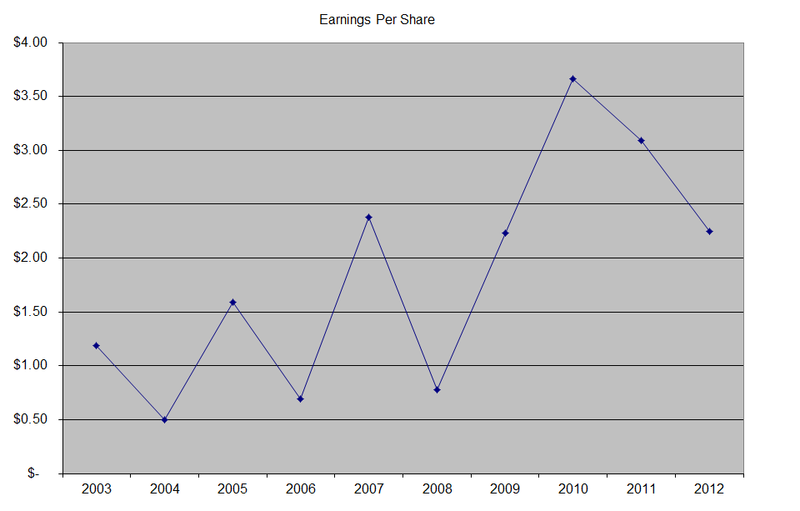 Earnings per share have been following a general uptrend, which has been quite volatile however. The company’s US operations have benefited from the recent launches of new generic products such as Lexapro and Actos. The patent cliff experienced by big pharma is beneficial for generics manufacturers such as Teva. Generics account for over half of the company’s sales. The company is under intense competition in the generic pharmaceuticals market, where being first to file might offer a slight competitive advantage to the filer. However, Teva is not immune to the patent cliff itself. Its multiple-sclerosis drug Copaxone, accounting for 17% of sales in 2012, will face competition from Mylan Laboratories as early as 2015. Future growth could also be realized from strategic acquisitions. The firm is expecting to benefit from the 2011 acquisition of Cephalon in terms of synergies, as well as adding its portfolio of products through its distributions pipeline. The return on equity for Teva has been on the decline from a high of 27% in 2003. Currently, it is below 10%, but if earnings projections materialize, it could go up to 15%. I generally want to see at least a stable return on equity over time. I use this indicator to assess whether management is able to put extra capital to work at sufficient returns. The annual dividend payment in US dollars has increased by 27.60% per year over the past decade, which is higher than the growth in EPS. 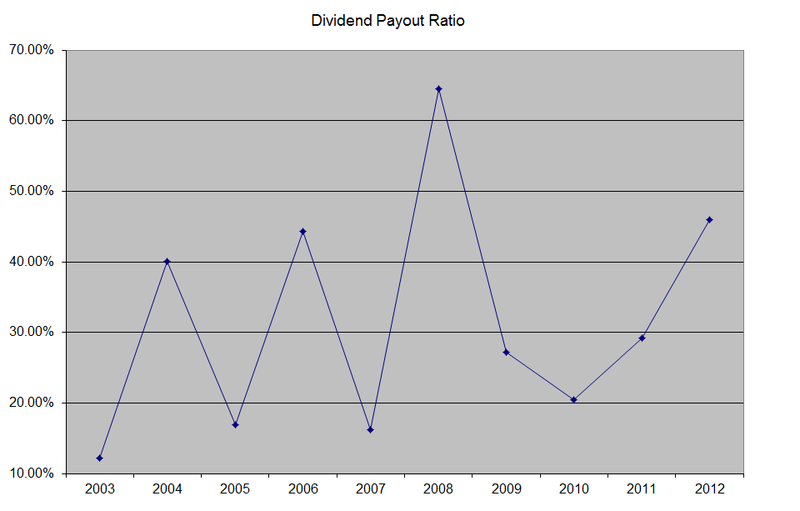 A 27% growth in distributions translates into the dividend payment doubling almost every two and a half years on average. If we look at historical data, going as far back as 1990, one would notice that the company has managed to double distributions every three years on average. The dividend payout ratio has increased from 12% in 2003 to 46% in 2012. A lower payout is always a plus, since it leaves room for consistent dividend growth minimizing the impact of short-term fluctuations in earnings. Currently Teva is attractively valued at 17.20 times earnings, yields 2.80% and has a sustainable distribution. Unfortunately, I am not certain if it has the durable competitive advantages that would help it differentiate itself from competitors. It looks like in the generic drugs industry, companies do not have any competitive advantages related to branding, that would allow them to charge premium prices. In the long-run, commodity producers cannot realize excessive profits, that would translate into fat future dividends. As a result, I do not plan on initiating a position in the stock. Your Retirement Income is on Sale! 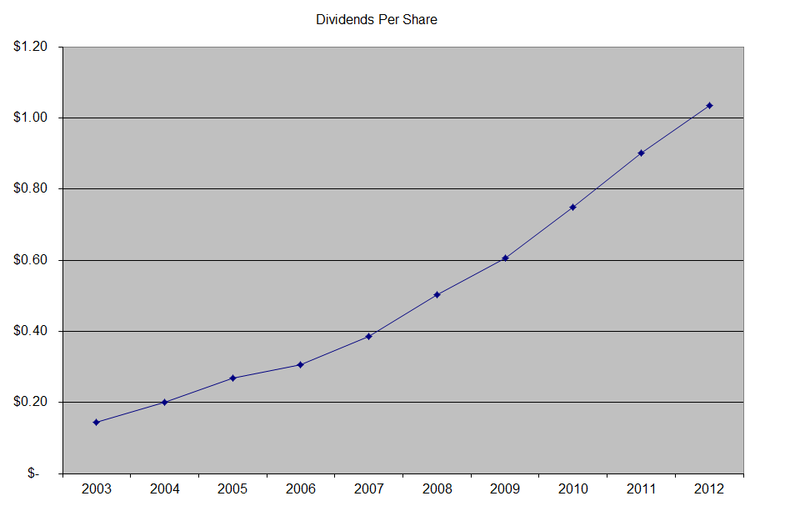 Is the Dividend Craze Over?